The Wide Open Harley-Davidson Softail Deuce fairing attaches to Memphis Shade Adj. Clamp Brackets and we must know the Fork Tube Size. 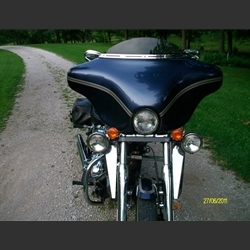 The Softail Deuce may also have Softail factory quick disconnect windshield brackets; if so specify which type when ordering the fairing for this bike. Spacers may be required to shim out to the fairing. The spacers are supplied. The turn signals may need to be relocated.